Over the last couple of decades, public administrations have been adopting performance measurement systems with a twofold aim: internally, to obtain feedback on the extent to which they are achieving their goals and, consequently, to have indications on the changes they need to introduce; and, externally, to support their accountability mechanisms. Within a principal-agent perspective, citizens are entitled to more information disclosure regarding the way public resources are being used and how well public services are performing. Given their accessibility and taking into account open government principles, the internet is an essential channel to convey information to a wide range of stakeholders (services users and citizens in particular) thus being crucial in promoting transparency concerning performance measurement. With reference to the Portuguese context, the current chapter analyses the performance information disclosure procedures implemented by the Directorates-Generals and evaluates some features of the performance indicators used. 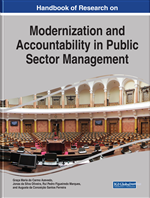 Assessing the performance of public sector organizations is essential to evaluate the results of public policies and to analyze the adequacy of the resources used to deliver such results (Jackson, 1993), to promote accountability, to drive improvement and to encourage stakeholders’ involvement in policy making. With such purposes in mind, and despite important variances and nuances among countries with different administrative traditions, governments worldwide have therefore designed and imposed some guidelines and rules to be followed by public organizations on what to measure and when and how to give account on their performance. In Europe, the Common Assessment Framework (CAF) was launched in 2000 by the EU, the European Institute of Public Administration (EIPA) and the Speyer Academy, as an ‘adaptation’ of the well-known European Business Excellence Model (EFQM/BEM) to the public administrations context (Engel, 2002). The framework was expected to become the main model used by public organizations when conducting performance assessment exercises. Almost twenty years on, one would therefore expect the CAF model to be somehow embedded in the public administrations performance systems implemented in each EU-country. In this regard, the Portuguese case might be particularly interesting, since Portugal has been a strong enthusiast of the CAF model, participating actively from the beginning in the international CAF forums and having a considerable number of registered CAF users. Understanding at what extent the CAF framework is in fact embedded in the performance systems adopted by public organizations and publicly disclosed is thus highly relevant. Over the last couple of decades, transparency and accountability claims have been pushing public administrations to disclose information on the way they are using their resources and how well public services are performing (Armstrong, 2005). The more recent influence of Open Government principles further reinforces the need to make such information easily available and ready to be used and re-used (Linders & Wilson, 2011). There is some evidence that performance measurement has significant value to all stakeholders, including citizens and legislators (Sanger, 2008). Reporting performance in an open way might, as Harris et al. (2011) suggest, enhance government’s reputation for competency and efficiency, thus contributing to a better government-citizen relationship. When mature stages of performance disclosure are reached, citizens become true owners, co-producers and evaluators of government (Sanger, 2008). The current research analyses to what extent the Portuguese Public Administration, at the highest level (which corresponds to the Directorates-General), is in fact conveying information on its performance through data portals (thus complying with the first requisite for being transparent) and whether such information covers the main areas of the CAF. To achieve this goal, a systematic analysis of the webpages of all Portuguese Directorates-General (PDGs) and of the GeADAP portal (where such data should be integrated and made available to all) was conducted in the first semester of 2015. The aim was to identify the goals, measures and final results that were part of the performance evaluation system – QUAR – for the year 2013. A content analysis of such indicators was then carried out to understand how they fitted into the CAF criteria. The remainder of the chapter is structured as follows. Next, in the background section, a brief overview of the literature on the main requirements of performance assessment in Public Administration is given, together with a short description of the Common Assessment Framework. A subsection is specifically dedicated to the new Open Government trend, particularly with the emphasis on promoting transparency and accountability through the release of open data. Then, the essentials of the Portuguese public administrations’ performance measurement system, that entities are required by law to implement, are described followed by an explanation of the methodological approach used in the empirical study. The main results are presented and discussed in the subsequent section. The chapter concludes with some final remarks, calling attention to some implications that can be derived from the study. CAF (Common Assessment Framework): A model developed by the EU State Members and the EIPA (European Institute of Public Administration) to assess the performance of public administrations in Europe. The framework is inspired by other quality management model (the European Business Excellence Model in particular) and is based on the premise that excellent results in organizational performance, citizens/customers, people and society are achieved through leadership driving strategy and planning, people, partnerships, resources and processes. QUAR: ( Quadro de Avaliação e Responsabilização ; Assessment and Accountability Framework) It is the main assessment instrument of SIADAP. It is defined by each organization/service in the Portuguese Public Administration, incorporating the organization/service mission, the multi-year strategic objectives, the annual goals, the performance indicators (including the methods to verifying them), the existing resources, the degree of accomplishment of the goals, the identification of possible deviations and potential causes, and lastly, the final assessment of the organization/service (Law 66-B/2007, art. nº 10). SIADAP: ( Sistema Integrado de Gestão e Avaliação do Desempenho na Administração Pública ; Integrated System for Performance Assessment and Management in Public Administration) The overall performance assessment and management system in the Portuguese Public Administration, as legally imposed by the publication of the Law 66-B/2007. The system adopts a top-down approach whereby individuals’ and subunits’ targets and goals derive from the overall goals of each public entity (organization/service). GeADAP: The technological solution (software application) used by the Portuguese Public Administration to support all actions concerning the main stages of the performance assessment cycle as defined in (SIADAP). It provides a web portal (front-end) to gather all assessment information (QUARs) in a centralized repository. The web portal interface then lists all public entities (organized by ministry) and allows users (citizens) to choose a particular year to access the corresponding QUAR.